Leave it to LeBron James to wait until deadline day to make a decision, but the league's best player has finally made his intentions known. According to a report from Cleveland.com's Joe Vardon, James has decided not to exercise his $35.6 million option in his current contract, clearing the way for him to become an unrestricted free agent on July 1. Translation: let the games begin. If reports about James' intentions are to be believed, things are going to heat up quickly from here. As opposed to years past when LeBron took his time and effectively stalled the market until he wrapped up his decisionmaking process, several national reporters have relayed that he wants to have everything done by around the 4th of July, which provides a small window for teams to make their cases to the future Hall of Famer. This is probably good news for the Sixers, as is the news that he has declined the final option year in his contract. Let's go through a quick rundown of the relevant facts. While picking up the option in his deal could have meant staying around in Cleveland for another season, it also would have opened the door to a number of trade opportunities that are up against or over the NBA salary cap. Two of the main competitors on this front? The Houston Rockets and the Boston Celtics, the former probably being more relevant in this discussion. James is close friends with Houston's Chris Paul, and forming a trio with Paul and James Harden would have been one of his most realistic paths toward competing with the Golden State Warriors over the next few seasons. Without James, the Rockets already took Golden State to seven games this spring. But Houston is over the cap by a pretty substantial margin once you factor in cap holds for Paul (also a free agent this summer) and a probable extension for center Clint Capela. Had LeBron exercised his player option, Houston could have engaged in a rather straightforward swap of salaries plus assets with the Cavs, assuming James expressed to Cleveland that the Rockets were his preferred destination. That's not an option anymore. And though sign-and-trade possibilities are theoretically still possible, NBA rules dictate that a team can't end up with a team salary more than $6 million over the luxury tax following execution of a sign-and-trade. That would be damn near impossible for Houston in this scenario, barring one of their star players (theoretical James included) taking an unprecedented discount. In theory, there are plenty of teams around the league who could create max cap room to sign LeBron James if they really wanted to. The problem with getting there is they would likely have to sacrifice so much to get there that their basketball situation would no longer be enough to attract the likes of LeBron. That leaves us with three real contenders for his services: his hometown Cavaliers, the Lakers, and your hometown 76ers. The Lakers are technically the only team with the cap space available right this second to absorb James into their roster at his max-level salary, but the Cavs can continue to go over the cap to re-sign him and the Sixers only need to make small procedural moves in order to get to his number, none of which require sacrificing big contributors to the team. So now we're left to find out what exactly it is LeBron prefers when it comes to his next destination. The draw of home can't be discounted, as messy as the roster situation is for the Cavs and as damaging as it could be for him to continue to get curb stomped in the Finals by Golden State every year. Los Angeles would give him the best opportunity to paint on a blank canvas and bring/recruit other stars to join up with him. Between a potential Paul George signing or Kawhi Leonard trade, the Lakers could quickly pile up stars in sunny California. And then there are the Sixers, who theoretically offer the most straightforward path to being good right out of the gate. Supplemental moves would need to be made, sure, but the top-end talent is already in place. 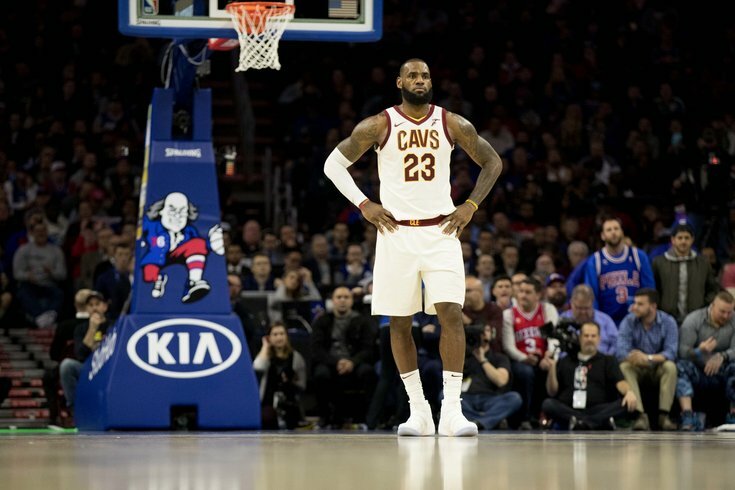 LeBron would join up with Joel Embiid and Ben Simmons along with the rest of the talented supporting cast, and that team would instantly be the East favorite. James would get to stay in the conference he has dominated for so many years while getting a boost from young, talented legs as he hits the twilight years of his career. What motivates his forthcoming decision is hard to say. Los Angeles is probably the favorite right now for reasons that have as much to do with his post-playing career as they do on-court things, but nothing should be considered set in stone. Five years ago this summer, the Sixers embarked on a radical rebuild that generated controversy around the league to an almost unprecedented degree. Stuck in mediocrity, an asset-bare team took a path straight to the bottom in a quest for needle-moving players and high-value picks. In that span of time, they have already procured an All-NBA center, a playmaking savant, several key role players, future first-round picks, and now finally a genuine opportunity to sign the league's best player. Whether or not they get him is a mystery, but the Sixers have a reasonable chance to bring in one of the game's all-time greats using nothing more than their salary cap space. Without the previous context that brought them here — the tanking, the heartless but ultimately correct trades, the patience in stockpiling prospects, the preservation of salary cap space — none of this is possible. The Sixers could very well have kept chugging along in the NBA's middle class, unable to do much of anything except exist as first-round fodder for the league's elite. Instead, they have watched as prudence paid off time and time again, in the form of their own players developing and veteran free agents seeing something special building. They've supplemented all that with upgrades to facilities that can't be overlooked either — moving from practicing at a college gym to your own 24/7 facility is a dramatic and important shift. The Sixers have invested a lot of time, money, and energy to get here, and in some cases have withheld those same things in order to make sure they could arrive here on time. So here we are, with LeBron on the verge of making another league-altering decision and the Sixers firmly in the mix. JJ Redick's crazy one-year deal aside, this a franchise whose last marquee free-agent signing was Elton Brand coming off a torn Achilles tendon. They have come a long way in a fairly short amount of time, and fans and higher ups alike should take a moment to appreciate that on the verge of free agency.